The top step of the podium at the Gold Coast 2018 Commonwealth Games but for England’s Paul Drinkhall and Liam Pitchford, in order to have aspirations of repeating the success at the Seamaster 2018 ITTF World Tour Asarel Bulgaria Open in Panagyurishte, negotiating the qualification tournament was the first priority. On the early afternoon of Wednesday 15th August, a place in the main draw was secured; a straight games win was recorded against the Latin American partnership formed by Paraguay’s Marcelo Aguirre and Brazil’s Thiago Monteiro (11-6, 11-8, 11-5). A comfortable win for Paul Drinkhall and Liam Pitchford; for arguably the most prominent pair in the Women’s Doubles qualification tournament, it was the very same outcome. Romania’s Elizabeta Samara and Bernadette Szocs beat the Belarus partnership of Alina Arlouskaya and Alina Nikitchanka (11-6, 11-3, 11-4). 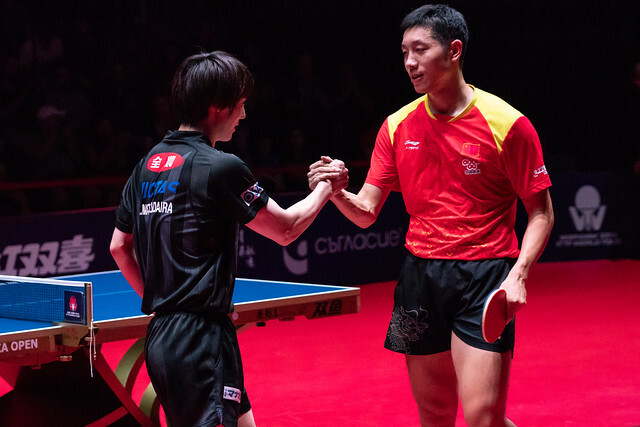 Wins without drama but there were close calls as both the Men’s Doubles and Women’s Doubles qualification events came to a close. In the former, Belgium enjoyed success by narrow margins. Florian Cnudde and Thibaut Darcis overcame Russia’s Alexander Shibaev and Kirill Skachkov (7-11, 12-10, 9-11, 11-6, 13-11); Robin Devos in partnership with Finland’s Benedek Olah, eventually ended the hopes of Denmark’s Anders Lind and Tobias Rasmussen (9-11, 11-5, 16-18, 11-5, 11-7). Similarly, the Czech Republic’s Lubomir Jancarik and David Reitspies endured difficult times, before emerging victorious. Eventually they prevailed against the French combination of Andrea Landrieu and Romain Lorentz (9-11, 11-5, 16-18, 11-5, 11-7). Meanwhile, in round that decided places in the main draw of the Women’s Doubles event, there were also close calls. Korea Republic’s Lee Yujin and Park Joohyun needed the full five games to beat Germany’s Chantal Mantz and Wan Yuan (6-11, 11-8, 11-7, 9-11, 12-10), as did the pairing of the Czech Republic’s Dana Cechova and Britt Eerland of the Netherlands when facing Brazil’s Caroline Kumahara and Bruna Takahashi (11-8, 10-12, 6-11, 11-7, 11-4). Qualification complete, the main draw commences on Thursday 16th August.